MMI uses an innovative approach to hospital planning: All relevant available data of the hospital are collected in a so-called “data cube”. This new method was developed by Andreas Walter (MMI Schweiz AG) and Prof. Dominique Brodbeck (data expert and lecturer at Highschool for Life Sciences FHNW in Muttenz/CH). MMI collects and analyzes all data and information and incorporates it into our overall planning approach. The results of our analysis form the basis of the departments’ and clinics’ spatial arrangements. The so-called “gravity model” (see graphic) facilitates data analysis and visualization. The edge of each circle depicts the abbreviations of all clinics and departments. 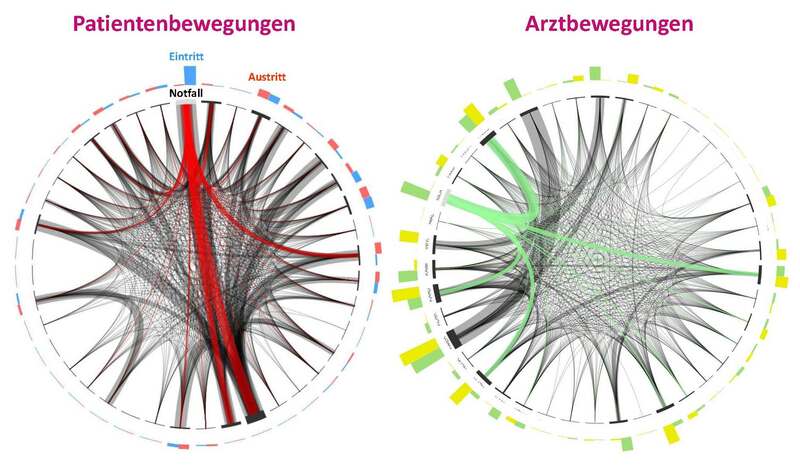 Each patient movement is charted within the circle as a fine line to illustrate the patient´s route taken within the hospital from the moment of entry until his departure. The graph below, for example, clearly depicts a concentration of patient movements in the emergency room area. The higher density of some lines shows which routes are most frequently taken by patients. This graphic helps to determine which clinics or departments should be adjacent to each other to minimise distances and thus enable efficient and more economical treatment workflows. The left-hand graph below depicts ambulant patient data and the incongruous registration of patient visits within individual departments. It further shows the spatial distribution of departments in relation to patient visit registration. The graph on the right illustrates how the data analysis findings have been collated to create thematic clusters. The below graph for example, shows the formation of a cardiovascular and vascular cluster. This analysis minimises patient and staff travel distances and promotes more efficient and economical work processes. This graphic 3D model illustrates the stark difference between the existing layout and the future spatial concentration of the clinics. The lines which depict the movement of patients clearly highlight the significantly shorter travel distances in the new planned model. Due to the relevant and informative value of the large data pool, the analysis yields clear and reliable results for the hospital. These results form the basis of the complete hospital or master planning. In conventional planning approaches (often based on hospital-internal decisions or hierarchies) there are significant uncertainties and deficiencies that frequently only become apparent later in the planning process. The innovative approach offered by MMI was developed under the direction of Andreas Walter (MMI Schweiz AG) and Prof. Dominique Brodbeck (University of Applied Sciences/Northwestern Switzerland). 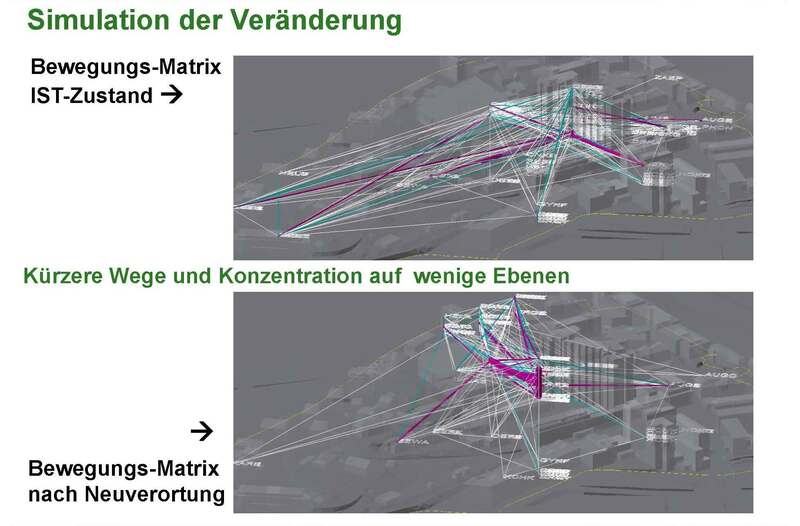 The method was first used in the master planning of the University Hospital in Bern („Inselspital“ CH), where it significantly improved treatment workflows. MMI has continuously developed the “data-cube” method which is now universally included in the companies planning services. This data-driven approach is innovative yet exceedingly accessible and therefore widely supported by medical directors, heads of departments, hospital staff and the general public. It therefore facilitates a common understanding which promotes a positive environment for the general planning process.